I love tuna sandwiches but wanted to try and eat a little less bread, so I decided to add my tuna salad mixture to a large piece of curly lettuce instead of bread and roll it. This is how I came up with these Tuna Salad Rolls. These rolls are not only healthier and better for the waist line, but are so delicious. A tuna sandwich is good, but this is even better. It’s now my go to lunch because it’s quick, easy to make and just as filling as a sandwich. You really have to try making these Tuna Salad Rolls. They will become one of your favourite lunch as well. Mix all the ingredients together well, except for the salad. 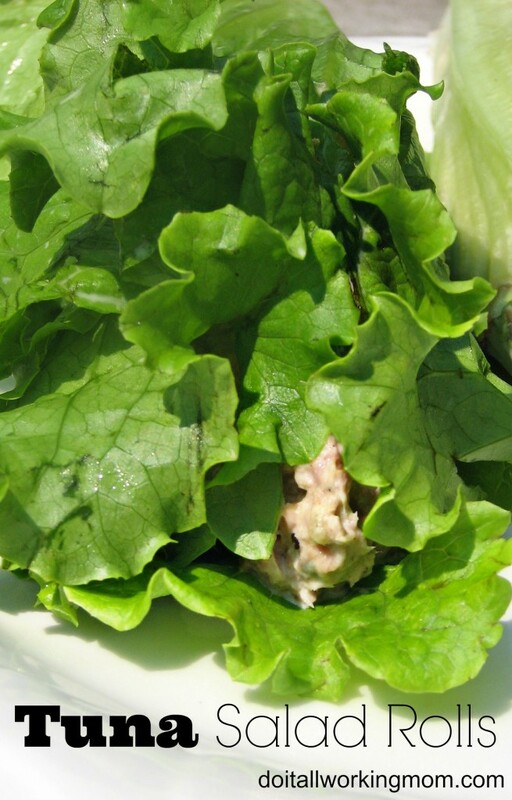 Divide the tuna mixture between the 4 large curly lettuce leaves. Place the tuna in the middle of the lettuce leaves. Mix all the ingredients together well except for the salad. I always have some canned tuna in my pantry. It’s good, nutritious and you can prepare so many easy recipes using canned tuna.